Trump International Beach Resort is an independently owned and operated hotel located just 15 minutes from Ft. Lauderdale Airport and only 20 minutes from Miami Airport. We have negotiated the great rate of only $199/night with the $25/night resort fee waived. This elite facility includes a wide-range of beach front activities and dining, two pools, spa exercise room and restaurants — with numerous other attractions near by —- and all rooms have water views and balconies! This presentation shares the essential best practices for building not just good relationships, but *trust-based* relationships. It will also include an explanation of the specific trusted advisor skillset essential to leading with true customer focus. As a follow-up to the keynote, there will be a workshop by Trusted Advisor Associates on Critical Skills for Increasing Influence and establishing a trusted advisor relationship. This co-presentation by internal consulting (IC) leaders will look at business transformation from various perspectives and solicit feedback on member experiences in helping to lead their companies in this journey. This session provides an overview of key programs for development of IC capabilities & skill sets and providing career development paths — including recruiting programs and innovative training and consultant development approaches. 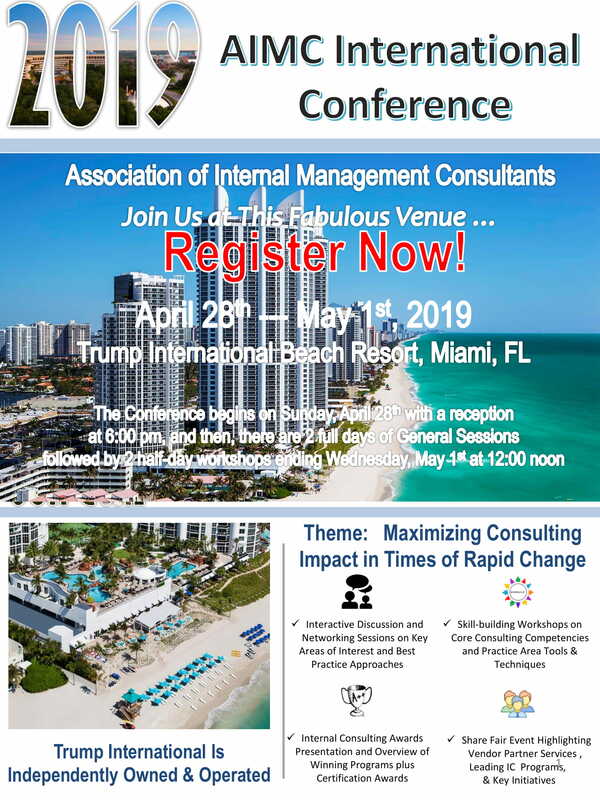 This session will provide key insights regarding the effective utilization of external consultants to provide maximum value and avoid pitfalls. Panelists will include perspectives from internals and external consultants with whom they work. This co-presentation focuses on important technologies which ICs need to be aware of, including: applied analytics; robotics; crowd-sourcing and design thinking. This session provides insights regarding how to effectively imbed internal consulting expertise into the project management process, including change leadership, maximizing value creation and implementation imperatives. Features an interactive dialogue with the leaders of winners of the Overall Excellence, Consulting Process, Business Impact, and Project Awards — including an overview of their programs and addressing issues of interest. Eliminating bureaucracy and responding to rapid change by operating with agility is a business imperative to win in the future. Forward-looking leaders of internal consulting teams will play crucial leadership roles in this new environment. Using real-world approaches and outcomes among internal consulting teams from some of the World’s most innovative companies, participants will be prepared to more effectively lead their own teams and to more confidently deliver lasting change to their executive partners. A networking session to discuss future challenges for internal consulting and how the AIMC can assist in preparing our members for success, including: awareness of emerging technologies; important methodologies; best practice approaches; and training and certification needs. This session will provide an overview of leading process improvement approaches and practical insights for effectively managing these programs. There will also be a review of recent research on end-to-end process management and other best practice approaches. Explores key benefits and challenges of different internal consulting models, including: funding approach; capability enhancement; business development; organization structure and recruiting models. It’s easy for internal consulting organizations to lose touch with their customers. This session will share the insights gleaned from business leader interviews about their needs and best ways to position IC Groups for success. This will also include a case study focusing on key roles that can drive significant business transformation and improve results. This marquis event, which includes a formal reception and dinner, recognizes the Award winners for Overall Excellence, Consulting Process, Business Impact, Partnering with Externals, and Project Performance. Also, Consulting Skills Certification recipients will be recognized. To receive the Early Bird Discount, full payment must be received by February 28, 2019. Cancellations before March 1st, 2019 will incur a $50 administrative fee. After February 28th, 2019, only substitutions are allowed - no refunds or credits. Join us at Trump International Beach Resort, Miami, FL at a great rate of $199 per night includes Internet Access in the Meeting Room plus hotel room (Resort Fee is also Waived).. Please Click Here if you have not made your hotel reservations!